Those credulous enough to believe the absurd proposition that Michael “Oiky” Gove was anything less than a disaster as Education Secretary were still prepared to spin in his favour when Young Dave bowed to the inevitable and removed him. 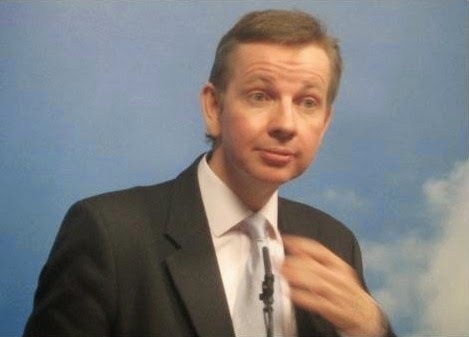 The myth of Gove the wonderful Parliamentarian followed him to the Whips’ Office. It has steadily and inevitably been eroded until finally being laid to rest today. Some on the Government front bench have taken against Commons Speaker John Berrcow. This has led them to believe that the view is universal. To this end, William ‘Ague’s last act as Leader Of The House - and as an MP, as he is not standing for re-election - was to introduce a motion to introduce a secret ballot to elect the Speaker, but in the next Parliament. This would, supposedly, make ousting Bercow easier. This would need the Chief Whip to get the votes, even though for some reason the Tories had got the Lib Dems to agree to the idea. That was down to Gove, the alleged miracle worker who was everyone’s friend and the master of all he surveyed. The reality was that “Oiky” depended on a large number of Labour MPs piling off and most Tories falling into line behind Master ‘Ague’s ruse. So it was never going to work. As the Guardian told, “The plan was only tabled by government late on Wednesday afternoon and was kept from Charles Walker, the chairman of the procedure committee … In a highly-charged debate Walker brought Labour MPs to their feet in applause when he revealed that Gove had given him no notice of his plan to rush forward a debate on the future of the Speaker”. Walker said “I have been played as a fool”. He wasn’t finished. “How you treat people in this place is important. This week I went to the leader of the house’s leaving drinks. I went into his private office and was passed by the deputy leader of house yesterday, all of whom would have been aware of what they were proposing to do”. They kept it from him. Tory back benchers lined up to pass adverse comment on ‘Ague. Jacob Rees Mogg was particularly displeased. David Davis said the matter should be debated “not in a mean-spirited ad hominem manner”. Philip Davies observed that it all “smacked of the kind of student union politics that has the fingerprints of the whips office all over it”. Labour MPs were adversely disposed to the whole idea. And, even with many of The Red Team absent, the vote was lost and Master ‘Ague ended up covered in more than confusion. There can be only one person who carries the can for this: the Chief Whip. Gove failed to get the votes to carry the motion. Gove made William ‘Ague’s last day in Parliament a failure. And it is now looking increasingly likely that, whether the Tories are still in Government next term, or relegated to opposition, he will no longer be their Chief Whip. He has been a total and utter failure from start to finish. That’s what you get from politicians whose ability comes mainly from being talked up by their pals in the press. Go back to being a hack, “Oiky”. You’re less dangerous at that. Yet another attempt by The Establishment, and their representatives in Parliament, to obtain their way by devious methods rather than open democracy which they profess they have signed up to. Very emotional speech from Charles Walker who clearly felt hard done by his leader and given a tremnedous spontaneous response from the opposite benches. Slightly off topic, what was also revealing about The Establishment was an earlier debate on undercover policing which revealed (if not already known) that it was mostly left wingers targeted (incredibly including MPs and Ministers in Government)presumably because it was thought they were a threat to said Establishment. As Paul Flynn commented in the debate Operation Tiberius (connected to the Daniel Morgan Murder Mystery) is the new old case file that needs to be brought out into the open before the general public, so that once known, the police can once more start to regain the public's confidence. A cynical person might think that Mester 'Ague knew the motion was doomed, but was quite prepared for it to fail in order to skewer Oiky. Or is that too Machiavellian? Whoever thought this stunt up failed badly. The whole debate, from the government's viewpoint, was cheap and shoddy; unworthy of parliament. How can anyone be surprised that some people have no time for politicians? Point of order - the proposal was not to elect the Speaker by secret ballot (that procedure is already in place). What was in question was the procedure at the start of a Parliament when the House chooses its speaker. If the sitting Speaker has been duly returned and indicates willingness to serve again, the question put to the House is 'That X do take the chair of the House as Speaker.' If opposed, the question can be divided upon. The proposal was to replace the lobby voting in such a question with a secret ballot. "Who do hell the Met think they are? Spying on ten MP's but covering up for others in child abuse cases!" I think the answer to that is "The Untouchables". Makes you wonder who was giving the orders in these cases as Jack Straw said in the debate he was unaware of the surveillance when he was Home Secretary!